Lists of names carved on War Memorials throughout the country mean little without biographical information and military history to accompany them. Glencairn parish now has its very own book – ‘The Glencairn Memorial Book’. Compiled by Alexander Hall and Anthony Murray-Flutter with family research by Eva Adamson and helped by numerous volunteers, all 72 men and 1 woman have entries, as well as other local men who failed to return home in 1918. Part 5 has notes on World War 2 fatalities. A surprising number of these soldiers have their names on War Memorials in other parishes of Dumfrieshire and Kirkcudbrightshire. A4 hardback, 205 pages with numerous portrait photographs, badges, illustrations and maps. Parts 1-3 contain the biographies of 72 men and 1 woman who died in the First World War. Part 4 contains notes of 22 men who were associated with the Parish of Glencairn but whose names are not on the War Memorials. Part 5 contains notes of 12 men and 1 woman who died in the Second World War. This A4 book has been produced to a high standard and will be valued as a historic and educational reference book. The stories behind the names on the War Memorials have been graphically revealed ninety years after the events. 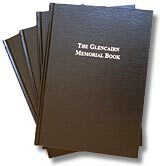 ‘The Glencairn Memorial Book’ book costs £15 (free delivery to Dumfries) or £20 posted. This is an admirable book, compiled and researched by Alexander Hall and Anthony Murray-Flutter. It has handsomely achieved its aim of raising the profile of our WWI and WWII War Memorials. 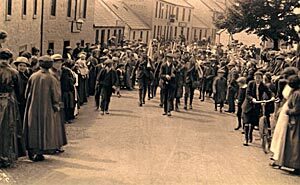 The thorough and comprehensive research has resulted in a book full of fascinating background information on those whose names are recorded in the village of Moniaive and around the Parish of Glencairn. A rich source of family relationships and service history, it transforms the stark statements of listed names. The book represents a window into the early and middle 20th century and can remind the modern reader of the social changes and retained similarities in rural parishes over the last ninety years. It is a readable book, of particular value to those at home and abroad who are researching their roots. It set out to be a Millennium project and all those involved in its production should be congratulated. This is a book that deserves a place on your bookshelf.